Hi, I am interested in your 2003 Chevrolet Corvette Convertible (stock #1333-NSH) listed on Autotrader for $25,995. I'd like to get more information about this vehicle and confirm its availability. 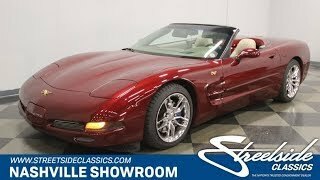 This is a very fine example of a 50th Anniversary Corvette presented in one of the most beautiful and frequently ordered colors of red that was specially mixed by Chevrolet for this car. Combine that with the advances in chassis and handling that were introduced on the C5 Vettes, and you have a car that is equally at home carving up back roads or showing off its pedigree at a car show. This one year only, code 820K Anniversary Red was created by starting with a burgundy/red metal flake that was coated over with a specially tinted clear coat in order to get this gorgeous color. It is the original paint on this car and still has a luster and shine to it like its new. A gold 50th anniversary badge, which is a perfect complement to this color red, leads the way at the front. Touches of chrome and billet are present in the air intakes and Corvette is lettered in the tag cover in the center. Anniversary badges also appear on the front fenders just over the air extraction vents. The tan convertible roof looks great and the back of the car has more billet and chrome dressing out the taillights and tag bracket. Quad exhaust pipes peek out from the center of the rear diffuser with another 50th anniversary badge between them. Chrome C6 Corvette wheels complete the look and really dress up this C5 nicely. Open the door and you will find a beautiful Tan interior. The door sill is protected from getting scratched by a gold coating lettered with Corvette in black. The door panel has a long armrest comfortable for long distance cruising with the switches for the power windows, lock and mirrors at your fingertips. Leather bucket seats are works of ergonomic art with the 50th anniversary logo embroidered into the headrests and another one appearing on the padded console lid between them. The beefy leather wrapped steering wheel feels good in your hands and is mounted on a tilting and telescoping column so you can adjust it perfectly. The dash behind it is clearly visible with sweep gauges for the tach and speedo in the center and engine monitoring gauges to each side. The convertible roof tucks up under a body colored cover when it is down for a good look, and if you take a peek in the trunk, you will find another couple anniversary logos dressing out the liners. Pop the hood and you will find a completely stock and original 5.7-liter LS1 motor setting down in the engine bay. The serious horsepower and torque that it produces is sent back to a 4-speed automatic transmission mounted at the rear in order to provide 50/50 weight distribution and outstanding handling characteristics. The C5s used a new hydroformed box frame design that improved chassis rigidity and was a significant improvement, especially in the convertibles. The rest of the chassis is well known to provide supercar levels of handling with unequal length control arm suspensions and light weight, composite mono-leaf springs and beefy sway bars both front and rear. Power rack and pinion steering offers precise handling and good road feel and 4-wheel anti-lock disc brakes will really haul this car down from speed in a hurry if you decide to let the horses run. The rubber meets the road through 275/40/20s in the rear and 245/45/17s in the front mounted on those beautiful chrome C6 wheels. Come on down and check out this super nice example of a 50th Anniversary Vette. Then start thinking about what kind of adventures you would have with it.